One of my favourite places, here in the city of Genova, is Bar Boomerang. Initially it was the name that I noticed. Then the fantastic, never-tasted-better cappuccino drew me back again and again. 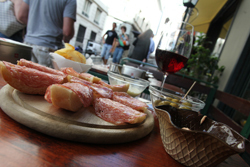 On this, my second visit to the city, I discovered that their aperitivo is the nicest aperitivo I’ve had so far. 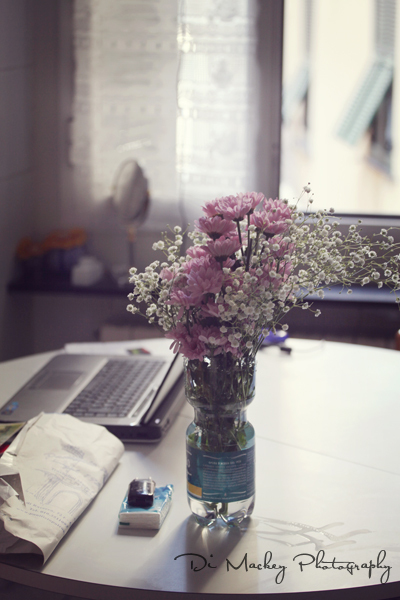 The staff are friendly, clients are important to them and their passion for the work comes through in all that they do. If you are in Genova, I recommend you find your way to this cafe and decide for yourself. In a small interview with Simona, the patient barista (patient in working with my New Zealand English), I asked a few questions about the cafe. She explained that the name had orginated from a visit that Marta, the owner, had made to Australia. Marta and her husband enjoyed the trip so much that they named their Genovese cafe Bar Boomerang. I need to explain that what we would call a cafe in New Zealand is a bar here in Italy, although alcohol is served so perhaps it becomes something of a hybrid. Open five years, the bar is located on via Porta Soprana, 41-43, not far from the ancient Genovese gate known as Porta Soprana. The gate, built in 1155, was originally intended as a defense rampart, with access for commercial traffic arriving via the interior, and acted as a barrier to would-be conquerors like Barbarossa and others. Today it stands permanently open, welcoming foreign creatures like me inside this ancient part of the city. As a tourist, a sometimes shy tourist without l’taliano, I was a little intimidated about just how to order my coffee. Of course, it’s quite simple. You wander into the cafe, order your coffee, select something to eat if needed and take it yourself. In most bars, you can either pay a little extra and take a seat or stand at the bar and drink without sitting. You pay as you leave. At Bar Boomerang, their work is a passion and I’m sure that is what makes everything taste so good. Simona took me through the four steps required to make good coffee. Obviously you begin with good coffee, then you make sure your machines are clean. The third step involves making a good press and the fourth, well that surprised me, it’s about noting the humidity and any changes in the humidity. If it changes, the settings on the coffee machine need to change too. The coffee is so very good. It’s one of the things I missed for weeks after leaving last time and I expect it will be the same this time. Most people know Italians take their coffee very seriously. I asked Simona about the ‘rules’ and she explained that a typical Italian customer might have cappuccino or latte in the morning. Milk coffee is only for mornings and laughing she said, not before or after lunch or dinner. This is more of a tourist thing or maybe in winter, on a really cold day. Expresso is for all the time, after lunch or dinner particularly, as its role is to aid in digestion. You could typically follow the expresso with a liquer of some kind like limoncello, grappa or jagermeister. I feel more relaxed when I wander into the bars here now, still imperfect and prone to crave cappuccino at inappropriate times but less worried. Bar Boomerang is open from 7am until 9pm, 6 days a week – closed Sunday. They also serve lunches but that’s another post over on the blog. I ate more pizza than I should have in Genova but eating becomes very much something I can’t be bothered doing when I’m out wandering ... cooking is even less likely to happen and so the pizzeria across the alley became a second home, specially while Pippa was staying. One night, I popped into the kitchen and took a series of photographs at Pizzeria Da Pino. Pizzeria Ravecca da Pino, Via Ravecca, 23r - 16128 Genova. 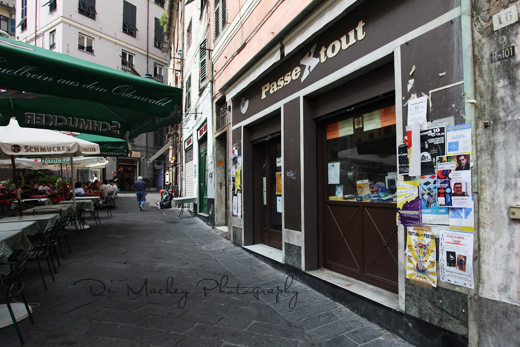 PasseXout internet cafe is one of the places I haunt while staying in Genova, is the internet cafe down in Piazza delle Erbe. It opens at 10am Monday to Saturday, closed Sundays ... understandably closed, as they stay open until midnight or later. The staff are friendly, they speak English and will sign you into their system as long as you can provide them with ID. When I returned after almost 9 months away, I still had .80 cents in time sitting there in my account. They don’t offer a wifi service but you can print A4 and A3 papers there. Internet time costs 3 euro per hour. Free wifi is restricted to a few cafes, 2 more since I was here last year but forget about Sundays, I haven’t located a Sunday internet source yet, and I have never seen more than 2 secured wifi signals floating loose here in the old part of the city. Anyway, PasseXout is located at Piazza delle Erbe 12R, and if you want to know more, you can mail them at ellepiemmesas@libero.it. Bottega degli Aromi is just next door at 16R Piazza delle Erbe and I was so very glad I wandered in this time, as the mosquitoes decided to feast on me. Initially, I did the usual and saw the pharmacist who gave me cream with hydrocortisone in it. I resisted smearing it all over my bites not liking the idea of the cortisone. Bottega deglia Aromi was an impulse followed. I popped in to see if they had anything homeopathic and they did. Crema cinque Fiori is the cream version of Rescue Remedy and my bites were much happier after it was applied. In English the cream is called Five Flower Cream and comes from Healing Herbs. You will also find Mario Rivaro and his exquisite gelato on Vico delle Erbe, 15/17R. My favourite flavour is the cherry gelato, the piccolo version in a cone is more than enough to satisfy on a hot day. However, that said, every choice offers new delights ... the lemon meringue gelato is stunning, as are the chocolate varities. Tasting them all is too much to ask. Here in Genova there is always someplace to buy flowers and Paola’s round dining table invites flowers, even if I still haven’t quite organised a vase. Today one of my water bottles has been sawn-off to play hostess to flowers bought at a market on Piazza Scio where we also discovered a large market and the sweetest smallest tomatoes. These last few days have been days of long conversations, where two old friends caught up on 5 years of absence and massive life changes. We reminisced, laughed over pizzas and red wine, caught boats and journeyed through that favourite space we most enjoy – the place where the land meets the sea. Genova was good to us, providing us with the very best foccacia at the beginning of each day or, on alternate days, unbelievably good breakfast cappuccino. We had days of wandering, cherry gelato, inexpensive yet good red wines, slow mornings and late nights. Pippa came to me 2 weeks out of New Zealand, via Haiwaii and Vienna, and our 5 days passed quicky. Yesterday we caught a train to Milan to say goodbye at an airport bus stop in a city on fire with heat and humidity. We talked through the 2 hour train trip to Milan, and then, after the goodbye, I possibly became one of the few people to have travelled with a slightly nervous, world-wandering friend, from Genova through to Milan only to leave her boarding her airport bus while I returned on another train within the hour and head straight back to Genova. That would be the train where the air-conditioning in my carriage was broken. Being a creature who prefers heat not too much above 20 celsius yesterday was a struggle and I struck out in search of a cool place only to find myself standing on tiptoes in a corridor, trying to catch something of the slightly cooler breeze as it came in through a high window. A very short elderly woman spotted the breeze in my hair, and came to stand in front of me, continuing to fan herself furiously as the breeze was never going to reach her. We all laughed, her son too, and I resisted the temptation to offer to hoist her up to the high window. Eventually a harried, sweating conductor came to our rescue and led us through to carriage 5 ... or I think that was what he was saying. I flopped into an air-conditioned 6 seat carriage with two men who left at the next stop. I could only smile over my own paranoia that they were moving away from this smelly foreign woman. Those last tunnels before Genova held us captive longer than necessary, as our train queued to weave its way into the main station ... the station I didn’t really know how to get ‘home’ from. I read bus stop lists and decided on Bus 33, it would reach Piazza De Ferrari eventually and I was too tired to do more than smile as Bus 33 climbed up into the hills behind Genova and took me around my destination, the one marked out clearly by the giant ERG sign down there near the old centre ... round and then down. The woman who sells me my breakfast foccacia discovered I come from Nuova Zelanda today ... we reached a point of understanding and agreement via gestures and our few words in common, regarding the fact that we both loved our countries of origin but admired each other’s too. The cafe where my favourite cappuccino is made is called Cafe Boomerang, in honour of the owner’s visit to Australia, and the gelato guy had an ‘I love you!‘moment when he realised I wanted the details of his shop for this website. There is so much here in this tiny corner of the city, so much to love. I’m holidaying with Gert for a few days now, trying not to talk to or photograph interesting strangers but it’s difficult. Even the man operating the boat trips to Camogli, San Fruttuoso and Portofino is going to cycle New Zealand next year.